Amazon Go: A.I.’s grim face? I have been waiting since college on RFID’s failed promise to deliver a walk-away checkout experience, and Amazon finally made it possible. After reading my co-blog writer’s experience in the Amazon Go store I had to check it out for myself and was excited for it. All my friend’s pictures were of long lines, but thankfully I am a morning person and there was no line when I got there. My goal was to pretend I had no idea what it was or how it worked. My experience overall was good, with the exception of the on-boarding process. I was greeted with a condescending “oh, you don’t have the app?” and was asked to stay aside. My T-Mobile reception was very poor so it took me a bit to get started. Once I downloaded the app and signed into my Amazon account everything was smooth. Mission accomplished! In this post, I’m not going to talk about the actual store (Ivan did a great job already) but about the implications of the first tangible and successful AI automated store. Automation has always been part of our history. Automation has helped us evolve into the society we have now. Such as, automating how we grow and crop food so we can have a good food supply, the industrial revolution to make things faster and cheaper, the assembly line to make them even faster and cheaper, and finally computers to automate processes and tasks. Now, AI is here and it will automate all of our productivity. “The craziest thing I’ve seen is someone who came in dressed in a Pikachu costume,” said an Amazon employee while she handed me a promotional bag with the Amazon Go logo on one side and the text ‘good food fast’ on the other. 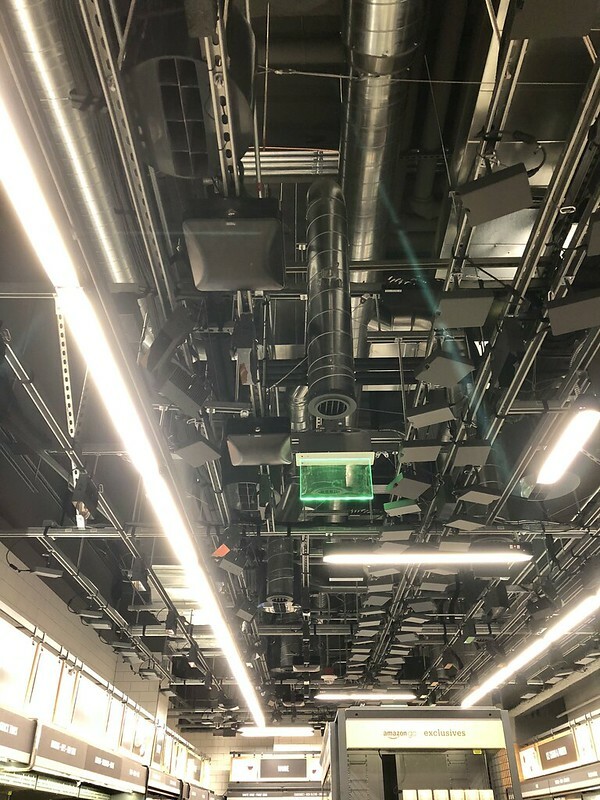 Each of those boxes on the ceiling are cameras connected to deep learning algorithms that analyze every move you make: which aisle you walk through, what items you grab to read and then return to the shelf, what items you put in your pockets or bag… everything to ensure you only get charged for what you take home. But also, everything to ensure your shopping pattern is studied and well understood. Maybe not today, but it’s the inevitable next step and the ultimate dream for any retail store: to know what their customers like and the type of advertisements that will work best on them. Are you rude to your virtual assistant? 2017 has been the year of the smart speaker. 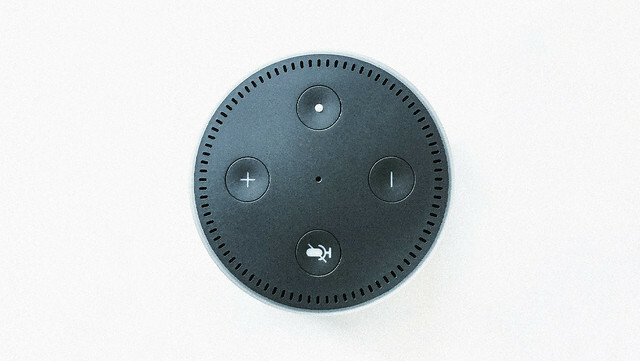 Amazon’s Echo Dot and Google’s Home Mini are currently selling for around $30, which makes them a popular Christmas gift. Using an Artificial Intelligence (AI) has never been cheaper and it’s finally reaching critical mass. Companies are investing on AI more than ever: natural language recognition still has to improve a lot, but the current algorithms are already impressive. My favorite example: it’s now possible to ask “how long would it take me to get to Starbucks on 15th Ave?” and get an accurate response with the right assumptions. What a time to be alive! All of this progress comes with side effects: having to learn how to talk to a machine. Often, people start talking without the wake-up keyword, and sometimes they forget to check if the device is actually listening, getting confused when there is no response to their inquiry. Talking to a machine is not easy and usually, very unsatisfactory. Perhaps that dissatisfaction is what makes us be less aware about our manners when addressing an AI. What would you think if someone interrupted you mid-sentence with a sudden “STOP”? What if someone kept giving you orders relentlessly, never pausing to thank you? That’s how most of us talk to AI’s like Alexa or Siri, never saying “please” or “thank you”. After watching Her last night (the Golden Globe winner for the Best Screenplay category) I was captivated by its amazing performances and its delightfully depicted technology. What motivated me the most to watch the movie was this article from Wired: why Her will dominate UI design even more than Minority Report. 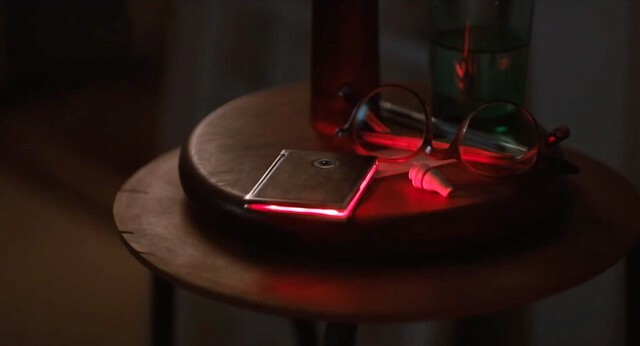 Visual user interfaces are almost nowhere to be seen, and that’s the message: human interactions are the future of personal computing.